That's why we've opened community services. This year’s theme is HOME, and we wanted to use this to showcase how we are opening services to help people all across Cornwall who are terminally ill, closer to home. So what are we doing and how can you help? “The world of palliative care is always evolving and we find ourselves responding to a growing desire amongst terminally ill patients to stay at home for as long as possible. Our two hospices at Mount Edgcumbe in St Austell and St Julia’s in Hayle will always be at the heart of our charity, but they provide acute care for very sick patients. What we wanted to do was extend our specialist care to those who are living with their illnesses at home and simply need information, advice and some therapy support to help them carry on. In other words we want many more people to benefit from our experience, whether they need eventually to go in to a hospice or not. I’m delighted to say our Community Services, including our Neighbourhood Hubs and Open Houses, have been extremely successful. We’ve already been able to support an extra 300 patients in the community and offer complementary therapies to close family members following a bereavement. Our therapy led Neighbourhood Hubs and volunteer led Open Houses give people a place where they can talk and seek advice in or near their own community. For these reasons, we’re also providing support at some GP surgeries, at existing community gatherings and relevant events and in the last six months have actively engaged in conversations with 215 people who may need our support in the future. We’re also working with our charity shops to ensure they have relevant information and will be running focus groups this year to see how we can better support those with learning disabilities, the gypsy and traveller communities and the homeless. 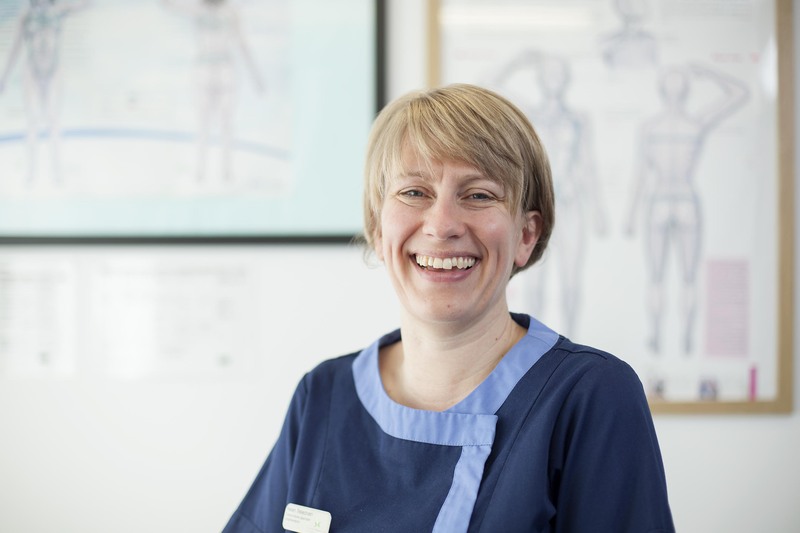 Helen Treleaven, Lymphoedema Specialist and Therapies Team Leader.